Kick off the holiday season at The Washington Ballet's Nutcracker! Join us for a private reception with the Ballet's Artistic Director Julie Kent before the show. Join the Harvard Club and The Washington Ballet (TWB) for a night of festive holiday celebration on Saturday, December 15 at the historic Warner Theater. In addition to the Nutcracker show, the Harvard Club is excited to host a private reception featuring the Artistic Director, Julie Kent. A world-celebrated prima ballerina, she is the longest serving ballerina in American Ballet Theatre’s 77 year history. In 2017, she was nominated as one of the most influential women in Washington by the Washingtonian. We're excited to offer this exclusive insider's peak inside our nation's premier ballet company. You'll have the opportunity to learn more about her past work, vision for TWB, and the Nutcracker. The Nutcracker also features current Harvard student and member of TWB, Sarah Steele. 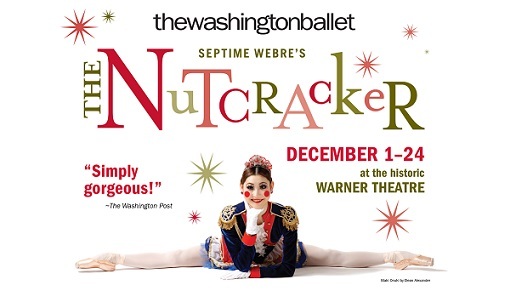 Check out The Washington Ballet's Nutcracker highlight video: Click Here. The private reception starts promptly at 5:30 pm. The lobby will be opened to the public at 6:00 pm. Show starts at 7:00 pm. Show tickets will be distributed during the reception. If you are not able to make the reception, the tickets will be made available at "Will Call."